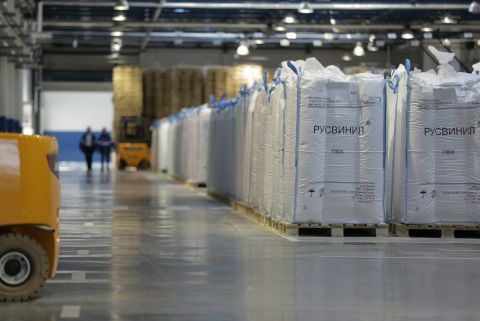 Four years after production of the first trial batch RusVinyl – Joint Venture of SIBUR and Solvay – produced a one millionth ton of suspension PVC. PVC is one of the most widely spread polymers which is applied in construction, automotive industry, electrical and other fields. RusVinyl produces suspension and emulsion PVC. PVC-suspension grades are used to produce window profiles, siding and other molding goods. «As of today our production unit is the largest PVC producer and the only emulsion PVC producer in Russia. The stable work of RusVinyl each year continues to confirm its leadership positions on the Russian polymer market. Whereas the quality of the product is maintained on stable high level. This important achievement became possible due to the efficient work of our people and also to the full support of RusVinyl shareholders which I am grateful for,” – Guenther Nadolny, CEO of RusVinyl, commented on this event.